SAP made a major move to get its offerings more oriented towards cloud-base delivery and shook up the procurement software market with an announcement yesterday that it would acquire California-based Ariba for $4.3 billion. SAP will pay $45 a share, or 20% more than Ariba's May 21 closing price. The price paid is a hefty one, coming in at about 106 times Ariba’s trailing EBIDTA. Ariba, founded in the late 1990s, calls itself a “business collaboration” company, but primarily provides tools to improve the procurement function, offering software for e-procurement, on-line auctions, spend visibility, and other purchasing related functions. However, in recent years it has added some "sell side" capabilities as well. The company leveraged the internet from the start, though its early solutions were traditional on-premise deployments. Later, it morphed aggressively on to the web, first calling itself a “Software as a Service” (SaaS) provider, now as a cloud-based solution as that term gets hot. It also runs the Ariba Network, which has connections to hundreds of thousands of suppliers and allows its customers to access catalogs, company-specific pricing, and other capabilities to streamline and control the procurement process, especially for non-direct materials. Ariba says some $822 million of goods were directly procured over the Ariba Network last year. SAP years ago announced plans for a similar type of purchasing community, but the program never really gained traction. All told, Ariba says some $320 billion of procurement spend is managed over its platform. Total Ariba company sales were about $443 million in its 2011 fiscal year ending last September, meaning SAP is paying just about 10 times sales for the company, a very hefty premium. Ariba's sales were $361 million in 2010, meaning growth was strong last year after flatlining a bit during the recession years. Even at ten times sales, some market analysts think SAP is getting Ariba on the relative cheap. "We think a counter-bid is likely and have raised our target to $50 from $40," said Cross Research analyst Richard Williams, though from our view it is hard to see what other companies would be interested or have the wherewithal to pursue such a deal in competition with SAP. Enterprise software competitor Oracle is the obvious possibility, but we have doubts it would want to enter a bidding war with SAP over the deal. IBM would seem another remote possibility, though it acquired Ariba competitor Emptoris in 2011. SAP itself already has substantial procurement functionality, and how its offerings will be reconciled with Ariba’s solutions is not at all yet clear, though SAP says Ariba will be maintained as a separate company. But the overlap is significant. That is standard language used in almost every software deal, while the reality is that most of the time the acquired company is eventually folded in to the acquirer’s business, though that process can take several years. Most observers also believe that SAP’s existing partnerships in this area, such as one with Hubwoo, will be discontinued over time. The move can be seen in part as another step by SAP to get its cloud credentials in order, as cloud-based computing is currently all the rage. At its user conference last week, SAP co-CEO Bill McDermott said SAP has now moved all of its software to the cloud, and promised it would lead the industry is cloud software revenue by 2015. "We don't have the DNA in the cloud," McDermott added in another interview, implying the Ariba deal would help inject some of that cloud DN into the company. The deal is probably viewed as both an opportunity and a threat by Ariba’s competitors such as Coupa, Proactis, IBM/Emptoris and others. There will naturally be some concern in non-SAP companies that in the end the Ariba solutions may be “SAP-ized” in a way that they won’t like, and competing procurement software solution providers will use that to throw some fear, uncertainty and doubt into the equation. On the other hand, Ariba competitors may see their hands weakened when competing for business in companies running SAP – which is a whole bunch. The deal is expected to close in Q3 of this year. Said IDC Manufacturing Insights analyst Simon Ellis on the bigger picture regarding SAP: "It was not too many years ago that I was starting to feel that the company was falling victim to the 'innovator's dilemma'. SAP was the quintessential immovable object; the large, on-premise, ERP behemoth that was getting more and more out of step with the things manufacturers were looking for, namely speed, agility and flexibility. Sure, there were things like rapid deployment solutions (RDS) designed to increase implementation speed, but winning in the cloud seemed destined for newer, smaller, more agile companies. Yet, in the 2 plus years that SAP has featured a co-CEO arrangement, the company has surprised many with large, decisive acquisitions clearly designed to capitalize on mobility (Sybase) and cloud (SuccessFactors, Ariba); and promising internal innovations for big data and analytics (HANA)." 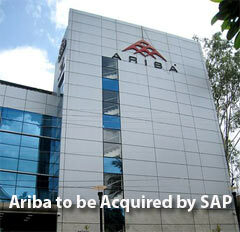 What is your take on the SAP acquisition of Ariba? How do you see the market shaking out? Let us know your thoughts at the Feedback button below. Having examined SAP as a solution for our company's finance module, SAP needs Ariba. Before acquiring this company, they basically had nothing to offer for procurement. This should help SAP's finance module greatly.